Wolf Commercial Real Estate, a leading South Jersey commercial real estate broker that specializes in South Jersey commercial real estate listings and services, is now offering a premier South Jersey land site for sale at 1301 North 26th Street Camden NJ. This South Jersey land site for sale is located on 1301 North 26th Street Camden NJ. The site at this South Jersey commercial land for sale through Wolf Commercial Real Estate, a South Jersey commercial real estate broker provides opportunity for such uses as industrial, warehousing, and offices along with housing (market rate, apartments, mixed use, commercial), assisted living facilities, child-care centers and community centers, new schools (private-connecting soft shorelines), or open space and park development, as well as the potential for a marina. There are +/- 26 acres of divisible South Jersey commercial land for sale on this site at 1301 North 26th Street Camden NJ. Both the $90 million Kroc Center and the $2 billion downtown waterfront project are nearby this land for sale in South Jersey. 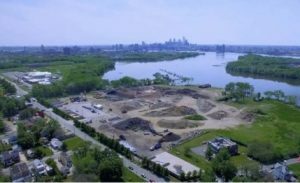 The property at this South Jersey land parcel for sale, zoned MW-2, sits on the Delaware River and overlooks the skyline of Philadelphia. Please call Wolf Commercial Real Estate for information on the asking sale price for this land for sale in South Jersey. This South Jersey land site for sale at 1301 North 26th Street Camden NJ is available for development through Wolf Commercial Real Estate, a South Jersey commercial real estate brokerage firm that specializes in South Jersey commercial real estate listings and services. Wolf Commercial Real Estate has been appointed exclusive sales agent to market this land for sale in South Jersey. The Walter Rand Transportation Center – with a PATCO High-Speed Line station and bus service to New York, Philadelphia, Baltimore, and Atlantic City – is nearby this South Jersey commercial land for sale through Wolf Commercial Real Estate, a South Jersey commercial real estate brokerage firm that specializes in South Jersey commercial real estate listings and services. This South Jersey land parcel for sale offers convenient access to Routes 38, 70 and 130 as well as I-95, I-295, and I-676. Businesses interested in this South Jersey land site for sale at 1301 North 26th Street Camden NJ may be eligible for incentives through the Grow New Jersey program, a job creating and retention initiative that strengthens New Jersey’s competitive edge in the increasingly global marketplace. In addition, businesses that will be creating or retaining jobs at this South Jersey land site for sale also may be eligible for state tax credits. For more information about this South Jersey land for sale at 1301 North 26th Street Camden NJ or about any other South Jersey commercial properties for lease or sale, please contact Christopher R. Henderson (856-857-6337; chris.henderson@wolfcre.com), Ryan J. Barikian (856-857-6307; ryan.barikian@wolfcre.com), or Jason M. Wolf (856-857-6301; jason.wolf@wolfcre.com) at Wolf Commercial Real Estate, the foremost South Jersey commercial real estate brokerage firm.